In the early 1990s, there was an article in the Weekend Australian on “The age of the econocrat,” which described the huge influence that economists in Canberra had on policy making at the time. It was an article which partly inspired my eventual career path. This of course was in those heady days of micro-economic reform. But there was an earlier age of the econocrat (i.e. the economic bureaucrat) in Australia, in the years of war and post-war reconstruction, in which one of the leading roles was played by the Director of Post-War Reconstruction, arguably the greatest of all econocrats, HC “Nugget” Coombs. 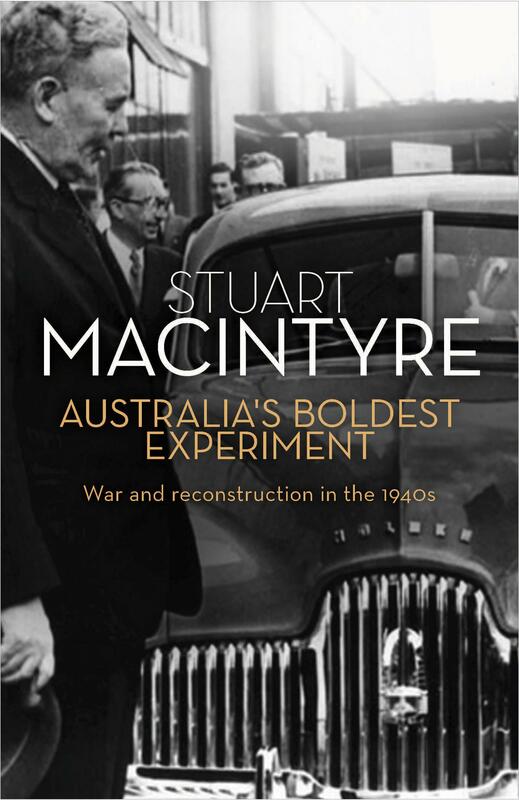 Stuart Macintyre’s brilliant history of this period, Australia’s Boldest Experiment, published earlier this year, takes us back to those extraordinary times. The book illuminates the important roles played by economists such as Coombs and Trevor Swan in post-war reconstruction, particularly in the largely successful demobilisation of troops after the war and the transition out of the war-time economy. But the book is no hagiography, and it draws attention to Coombs’s failure to repurpose his Department of Post-War Reconstruction into a ministry of economic planning that would provide a counterbalance to the laissez-faire prescriptions of the Treasury. As a former Treasury man, I am thankful that Coombs lost that battle. It was also fascinating to read in the book about the extraordinary influence on decision makers, including on then PM Ben Chifley, that one of the all-time great Canberra mandarins, Treasury’s Frederick Wheeler, had from such a young age. Wheeler would later head the Treasury in the 1970s and would become well known for his opposition to the Whitlam Government’s unorthodox financing methods. …even before the scheme was completed, there were claims that it did not add to the nation’s wealth but detracted from it. A critic argued in 1963 that thermal stations were a cheaper source of electricity and six years later the agricultural economist Bruce Davidson calculated that the private returns from additional farm production did not cover the public cost of providing the water. So the Snowy Mountains scheme should provide a warning to anyone with grand schemes in their mind. Macintyre’s book is highly recommended to anyone with an interest in Australian history or economy policy. I expect it would be of great interest to many of my former Canberra colleagues, who may marvel at the influence and achievements of the econocrats of the forties. This entry was posted in Uncategorized and tagged australia, coombs, demobilisation, econocrats, postwar, reconstruction, treasury, war. Bookmark the permalink. A great review of what sounds like a terrific book, thank you! Gene. Did some of these policies and schemes (such as the Snowy Mountain project) result from deliberate misuse of Keynesian thinking by some ambitious bureaucrats, who cleverly manipulated naive politicians into supporting them? I’m not sure these bureaucrats served us so well. Post-war politicians had recent memories of the 1930s depression, and feared the post-war demobilisation and immigration would recreate an army of unemployed. In the USA, the thinking was that the (Keynesian) New Deal had succeeded in creating jobs – a notion now largely discredited – and in avoiding the rise of communism. The USA replicated this model in post-war Japan. The post-war Chifley government was philosophically supportive of government controls and capex projects, but the new Menzies Liberals were ideologically different. To convince Menzies to support the government controlled and funded projects, bureaucrats needed to sell the value of jobs for the demobbed soldiers and immigrants, particularly in averting the growth of communism. The results were generally good for career bureaucrats, but mostly at the expense of good policy and national wealth. So the 1950s equivalents of the NBN project emerged – the Snowy scheme (with minimal cost-benefit analysis), massive tariff barriers for the local car industry, and government business undertakings are obvious examples. Australians paid the price of these silly policies for decades, when free market policies and less regulation could have rebuilt our economy more equitably and efficiently. But that would have not helped the careers of the bureaucrats, would it? It took the death of global communism and (ironically) the ALP’s Hawke-Keating governments, with rare bipartisan support, to undo some of the inefficient regulation and protection left in place since the 1940s. You would have enjoyed working in that era of better policy outcomes. So yes, there are some epic government projects, but were they ever good policy? Hindsight has proven them to be mostly inefficient and costly, sold by bureaucrats to naive and politically motivated governments. Some things don’t seem to change, do they? Thanks for the excellent comment, Michael. You make some good points about the poor policies that were implemented in the post-war years. Perhaps a more applicable historical warning from the econocrats is Bruce Davidson’s book The Northern Myth (1965). What he said 50 years ago is still true today (probably more so). If you look at all of the “develop the north” rubbish coming Gina Reinhart’s ANDEV, the IPA, and out of Canberra, Brisbane and Darwin (pick any discussion paper or strategy – they are all littered with the same flawed analysis), we should all be afraid that we really are not leaning anything too quickly. Many thanks, Jim. Great point. I’ll have to get a copy of that book because I keep hearing about it (and not just from you). I’m not up on economic history in Australia so I apologize for my ignorance, but if we’re evaluating a project such as the snowy hydro in retrospect, shouldn’t we also be considering the value of the carbon pollution abated by Snowy Hydro? Also potentially the costs of long-term unemployment abated by the scheme?